Hadrian’s WallSuspendisse lectus turpis, dictum non tincidunt id, lacinia id nibh. Nam consequat mattis turpis ut vestibulum. Pellentesque ultricies, eros mattis laoreet vestibulum, metus ligula mattis mi, ut tincidunt tortor leo vel sem. Suspendisse a leo a purus faucibus suscipit sed in nunc. Curabitur porttitor erat nisl, eu faucibus. Duis consequat tellus ac urna sodales, vel tempor justo scelerisque sed lectus enimvene. Hadrian’s Wall CountryCurabitur porttitor erat nisl, eu faucibus. Curabitur porttitor erat nisl, eu faucibus nulla lobortis lacinia. Sed quis sem et velit accumsan dignissim. Duis consequat tellus ac urna sodales, vel tempor justo scelerisque. Sed lectus enim, venenatis ac mi quis, luctus magna. Vivamus Donec commodo tincidunt accumsan. Morbi justo lectus, faucibus ac est ac. 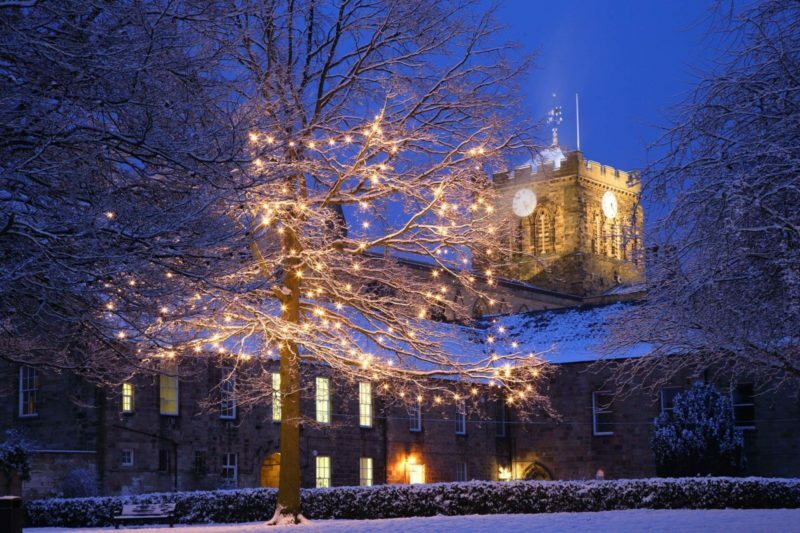 The Abbey Grounds in Hexham, Northumberland, has lights in the trees along the paths. With Hexham Abbey floodlit it creates a very traditional Christmas picture. 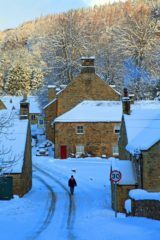 Allenheads claims to be the highest village in England. 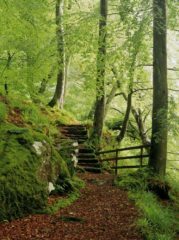 It was a centre of lead mining for centuries with a population many times greater than now. Today it is a small, peaceful village but there are still signs of its proud heritage. It has its own story portrayed in its Heritage centre. It is also has a ski club active when the weather permits. 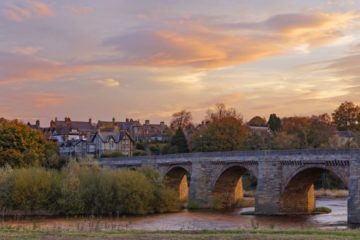 Corbridge is an attractive small town on the banks of the River Tyne in Northumberland. It has the Roman Station Corstopitum (aka Coria) with its museum of Roman life. This a good place to see the layout of a Roman Fort. Blanchland is a short distance south of Hexham in the beautiful scenery of the upper reaches of the River Derwent which constitutes the county border with County Durham. 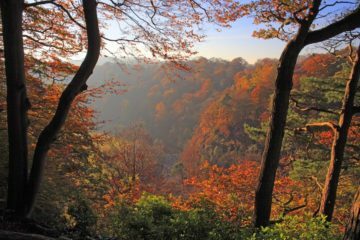 An amazing bright and colourful Autumn day at Allen Banks in South Tynedale, Northumberland, high above the Allen Gorge. The River Allen can just be seen at the bottom of the gorge. Spring in Allen Banks Woodland Garden in South Tynedale, Northumberland. 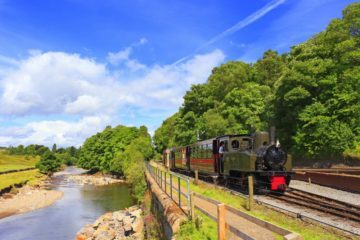 Allen Banks is where the River Allen flows through the picturesque wooded Allen Gorge. 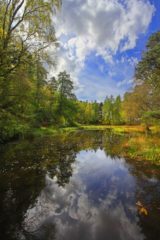 Allen Banks is a beautiful woodland garden given to the National Trust by the Bowes-Lyon Family in 1942. The River Allen flows through its dramatic gorge. The South Tynedale Railway is a narrow gauge railway with its old fashion station in Alston in Cumbria. 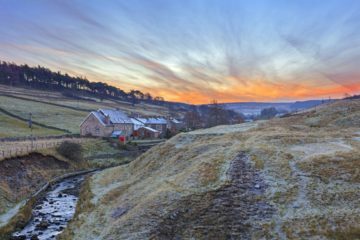 Its route closely follows the River South Tyne through the beautiful iconic North Pennine scenery of South Tynedale. 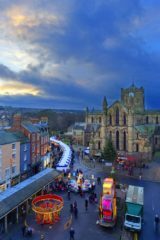 Hexham in Tynedale, Northumberland, during the annual Christmas Street Market. 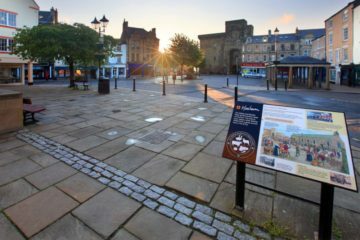 Hexham Market Place with its historic Shambles is dominated by Hexham Abbey. 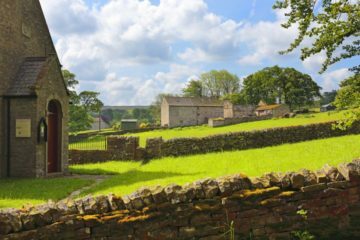 An iconic North Pennine view at Keenley Church near Allendale Town in Northumberland across to farm buildings. The River South Tyne on a blustery early autumn morning in South Tynedale, Northumberland. Like so many rivers with sources deep into northern hills the normally benign river can become a raging torrent in hours. 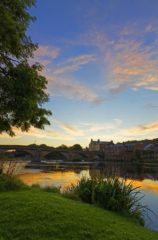 Hexham is by most standards a small market town but its location in a large very sparsely populated area gives it an important role as a social and commercial centre. 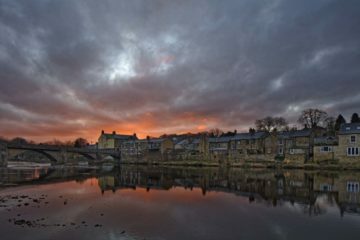 A wild looking sky reflecting in the River South Tyne at Haydon Bridge in Northumberland on a late winter morning.